This Holiday Season, Retailers Will Be Wishing For More Workers U.S. retailers are looking to add more than 700,000 jobs this holiday season — about the same as last year. But retailers may have a harder time filling those jobs because of a shrinking labor pool. 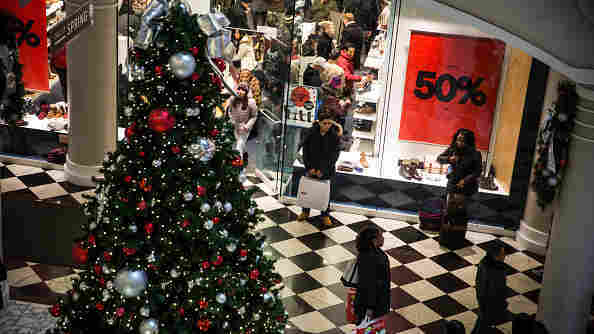 People do their holiday shopping in Manhattan Mall in New York City in November 2014. Retailers may have a harder time filling holiday jobs this year because of a shrinking pool of workers. This month, hundreds of thousands of Americans are starting seasonal jobs. They'll be helping holiday shoppers, who are expected to increase their spending by about 3.5 percent this year. Some retailers are adding more services like curbside pickup and same-day delivery. Stores will also have more workers on the floor, creating demand for seasonal hires. That's how it went for Mario Juarez last year. The 20-year-old started as a holiday temp at Target. But after three months, he got a permanent job as a stocker on the overnight shift. He says it was a good way to try out Target. "It's testing the water. You want to see what it's about, you apply seasonal and then if you like it or not, you can leave," Juarez says. The National Retail Federation says U.S. retailers are looking to add more than 700,000 jobs this holiday season — about the same as last year. But finding workers could be harder this time around. The U.S. unemployment rate has fallen to just 5 percent, the lowest in recent years. "It's people leaving the labor force. People sort of get fed up looking or they just don't want that particular kind of job," says Chris Christopher, an economist for IHS Global Insight. He says one reason for the unemployment dip is that some workers were discouraged by the recession and have dropped out altogether. In response, employers must hire from a smaller pool of job seekers. And these days, they need workers who can help boost sales both in the store and online. National Retail Federation chief economist Jack Kleinhenz says added conveniences and an improved economy are driving hiring. He points to the 650,000 job openings in August to prove his point. "We haven't seen that in the last 10 years. And there has been a considerable amount of hiring going on," he says. With more permanent jobs available, workers are passing on seasonal work. Some employers are offering higher hourly pay as an added incentive to lure them back. Delivery companies that partner with stores are also in a hiring binge. For example, FedEx says it's adding 55,000 temps. That's nearly triple the number from just three years ago.